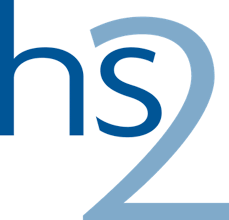 Following the arrival of a grant from the people running the High Speed 2 Rail project it was decided to go ahead with improvements to facilities within the church including a new toilet in the west tower and a new servery in the north aisle. 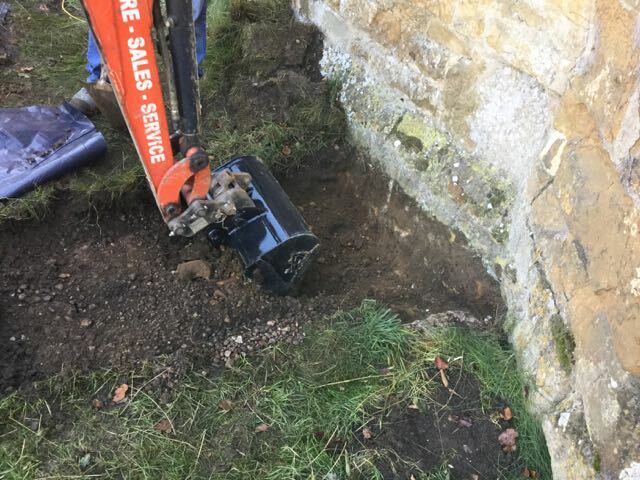 This meant the digging of a lengthy trench through the churchyard, something we already had experience with at Cropredy. Below are the daily reports posted as the investigations were carried out. I made a brief site visit to St. Peter’s this lunch time and talked to the team there. Slabs had been lifted from roughly half of the tower floor and we were able to take a preliminary look at what was going on underneath. The slabs, which are quite thin, are not terribly ancient but they are based on about 200mm of sandy make up above a what appears to be a dirt floor which may be medieval in origin. So the plan is that over the next day and a half the contractors will complete lifting the slabs and removing the make-up layer to the specified depth which will bring the level close to the early floor surface. They will be keeping an eye out for and setting on side for me to take a look at any material, bits of pottery or similar, which may help us date the construction of the most recent floor. I will return on Friday around 1.30 p.m. to take a look at the exposed surface at which point I’ll decide how much of the earlier floor to clean up prior to recording. Yesterday afternoon I spent time on site at St. Peter’s with the following results. Tower floor. The slabs and make up layer below have now been removed. 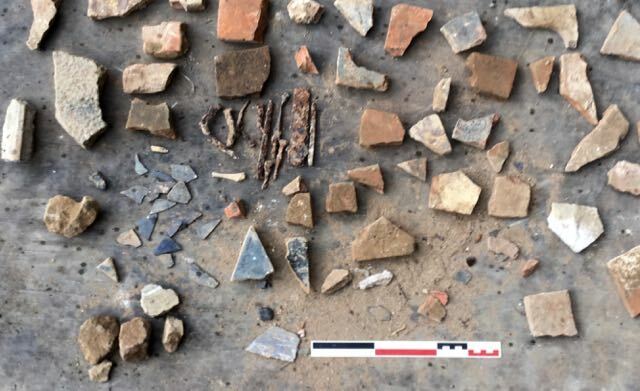 The contractors carefully set aside any artefacts they came across which included some fragments of decorated floor tiles, clay pipe stems and post-medieval pottery suggesting an 18th. or early 19th. century date for the insertion of the flagged floor. Below the make up was a dirt floor, almost certainly late-medieval in date from the fragments of pottery recovered pressed into the surface. In places the dirt floor had been patched with a screed of lime mortar. 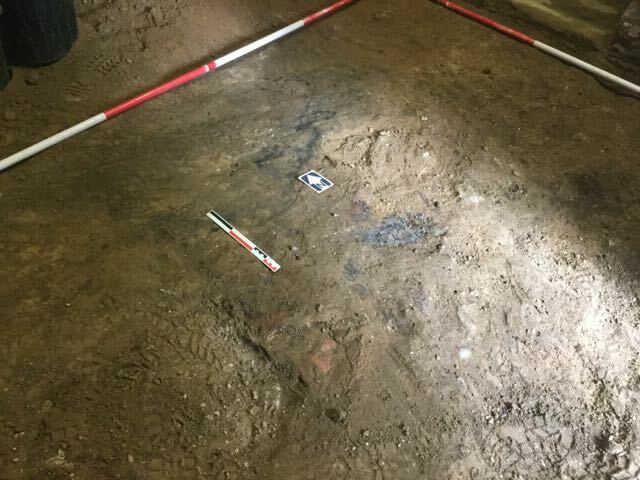 A central pit filled with plaster fragments may be evidence for early building operations. A lower level stone threshold to the east was also uncovered which appears contemporary to the dirt floor. Approximately 75% of the tower floor was examined in the time available but as this surface is not due to be further lowered no further investigation will take place. Churchyard trench. 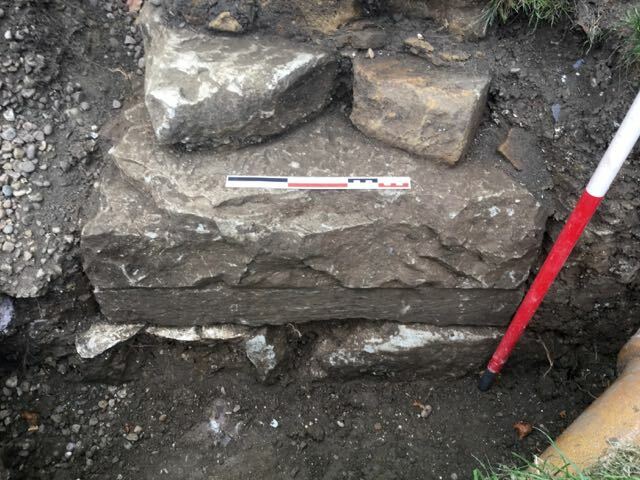 Turf has been stripped from the trench revealing a significant deposit of stone fragments, possibly remains of metalling for an earlier path or perhaps the remains of an earlier churchyard wall. The middle section seems to have a greater depth of topsoil whilst closer to the church the hard clayey subsoil appears closer to the surface. 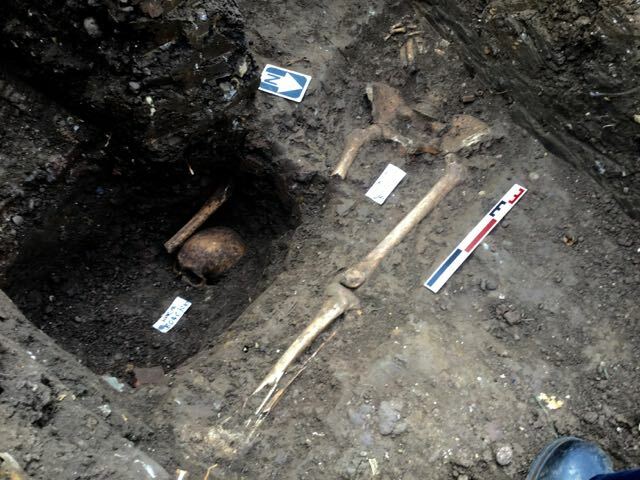 This may give an early indication of the location of possible burials. Turf stripped from the line of the ptpe trench. A very productive session with the sun shining all day. 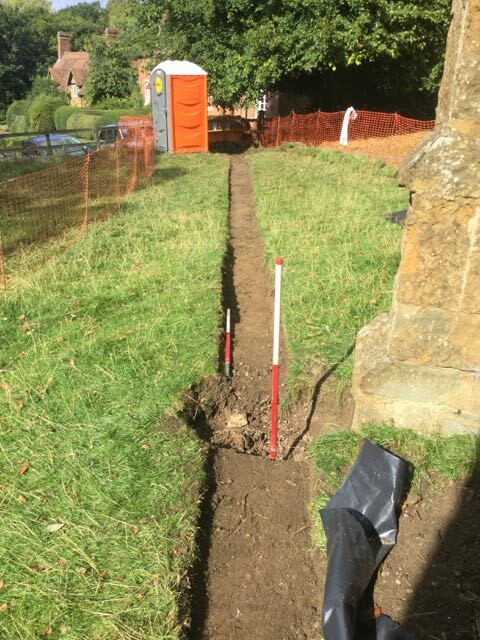 A new trench was dug firstly by digger and then by hand against the face of the north wall of the north aisle with an extension to examine the footings for the diagonal buttress on its north west corner. There were some very interesting pieces of clearly reused stone built into the buttress base. Round the corner the hole drilling through into the base of the west tower proceeded apace. The trench dug out to allow access for the drilling rig has not been examined but there is a very interesting offset course which has hitherto been buried. 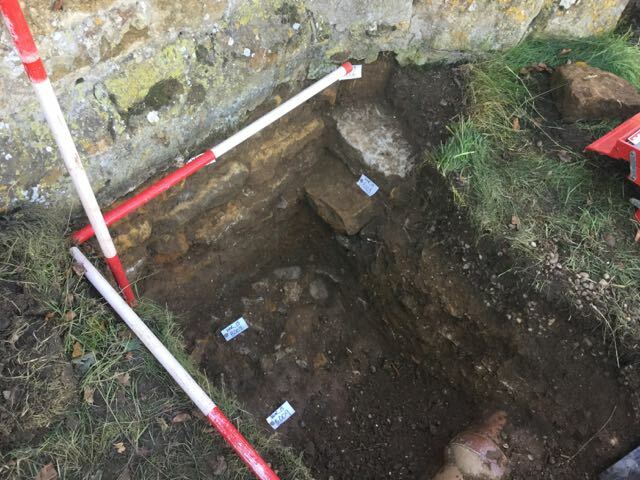 A pit was dug by the contractor on the inside of the tower revealing the fact that the wall with good faced stones continues well below the last identified floor level. Once the drilling is completed tomorrow I plan to clean and examine and record both of these trenches. At the north end of the pipe trench a deep pit was dug to a depth of around 2m. This showed us a fairly undisturbed sequence of topsoil, subsoil, natural red clay and natural red sand with no signs of human activity below topsoil level. Tomorrow we also plan to begin the excavation of the 20m length of trench from the tower to the northern boundary of the churchyard. .. and in the north west corner inside the tower. Well it had to happen. an intact burial or two with maybe more to follow. 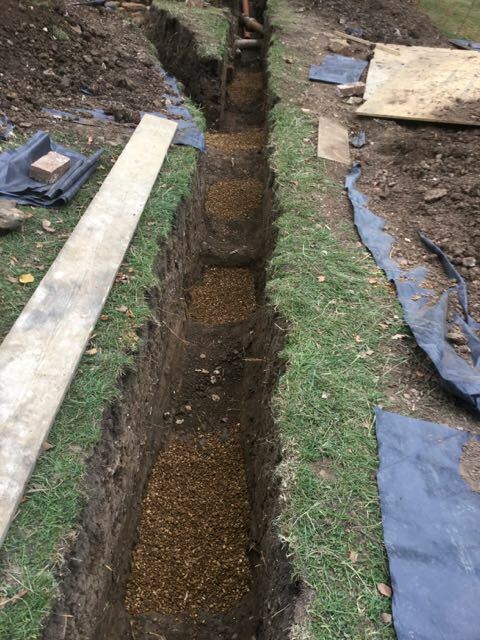 I’ve informed the incumbent, archdeacon and DAC as per the faculty and await the archdeacon’s approval for work to continue, This is not a major problem as I feel we can carry on digging out other sections of the trench avoiding bones for now. What it does mean is the possibility of extra days on site and some delay in the completion of this phase of the work. I’ll know more about that by the end of play tomorrow. 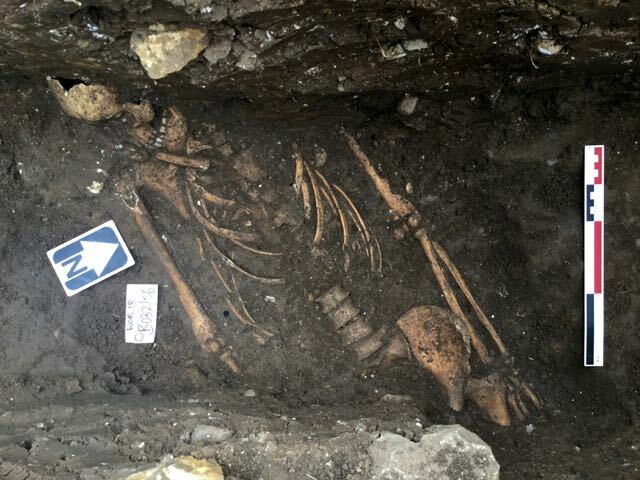 The burial is not particularly deep and is probably therefore late medieval. 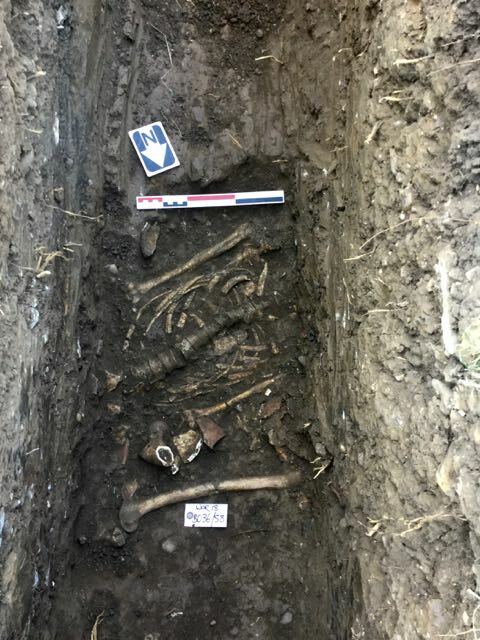 I believe the bones are of a juvenile or young adult and the section we have is of the middle of the body with some ribs, a forearm crossed over the stomach region and a very decayed pelvis. Conditions for excavating the remains are quite challenging given the narrowness and depth of the trench and the hardness of the ground plus there is likely to be at least one more burial at a slightly higher level immediately to the south and who knows what else. 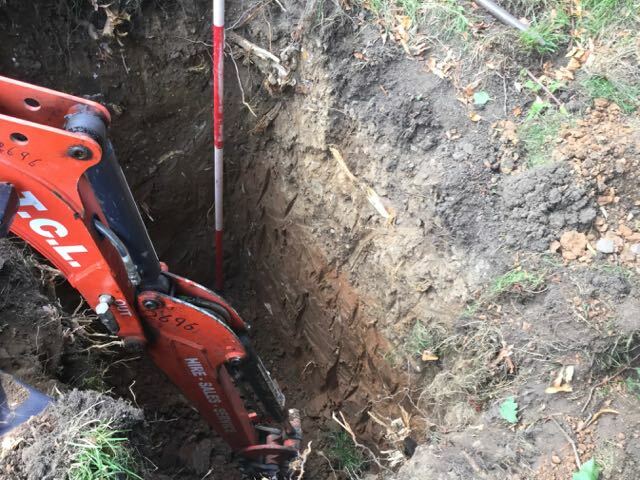 Early in the day we had cleared the topsoil using the 450mm toothless bucket from pretty well the entire length of the trench in an attempt to identify the location of specific graves or the remains of associated monuments. No features were observed at this level and so I gave the go ahead to deepen the trench in sections to its full depth. Because of the prevalence of tree roots and a very solid red clay I authorized the use of a toothed bucket to break up the ground before reverting to the bladed bucket to scrape surfaces clean. Even so I was not surprised that we didn't’t see any higher indications of the burial we encountered, even knowing where it is now it is still hard to see the grave cut into which the burial was inserted. Whilst I examined this collection of bones the trench digging continued beyond that point at a much higher level. 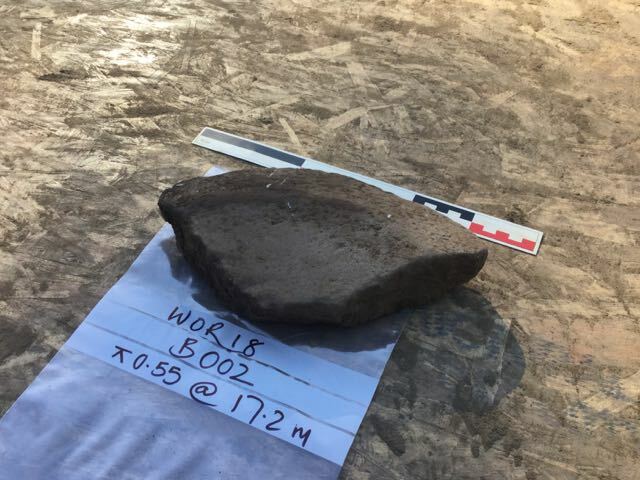 One particularly interesting find that came out of the sub-soil was a fragment of a shallow circular stone basin which I think may be a section of a quern for grinding corn, possibly early medieval or even pre-historic. Up against the church wall the drilling was completed through the wall into the base of the west tower freeing me up to begin an investigation of its footing. perhaps a little surprisingly the dressed face of the wall with two chamfers continued down to a considerable depth. 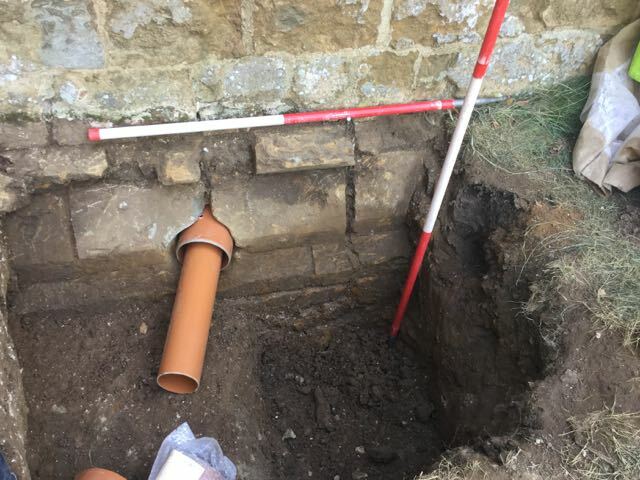 Meanwhile the recording of the footings for the both aisle wall being completed the drilling crew moved on to their and at the same time removed an area of sobs in side the north west corner of the north aisle to receive the incoming pipework, again this operation was recorded. The deep pit for the inspection chamber cuts through layers of natural. The first burial, of a juvenile. The stone bowl, a possible quern? The day began with a widening of the trench to a full 450mm to enable me to fit into it a little more comfortably! Once in place some additional work was done to establish the position and extent of the juvenile skeleton before turning attention to the bone fragments observed yesterday a short distance to the south. Once the loose had been cleared it became clear that we had a skull and jawbone against the west side of the trench. Working downwards from here during the course of the morning this second skeleton was uncovered down to the base of the rib cage. The bones, especially the vertebrae were in poor condition, spongy and brittle perhaps indicating a medical condition of some kind. Once cleaned up both burials were photographed and drawn onto the master site plan. 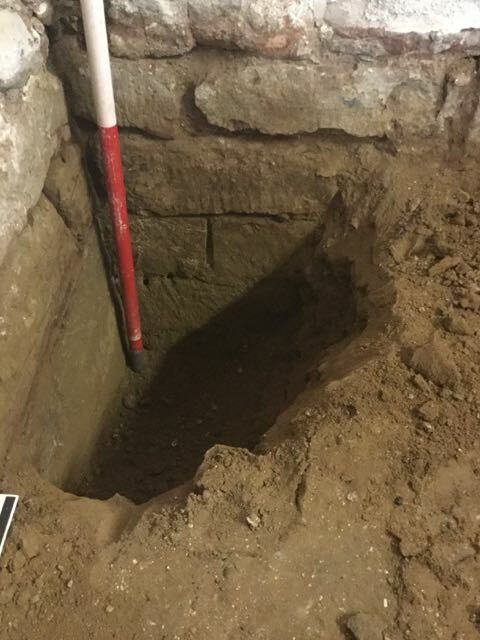 We were unable to proceed further as we need to obtain authorisation from the archdeacon before lifting the bones. Time was taken to further excavate at the foot of the north wall of the west tower and profiles, plans and sections were drawn here. Notes were also made of the walling exposed in the deep pit cut into the inside corner of the north aisle. It was also possible to record the full depth of the foundations for the diagonal buttress on this corner which went down far deeper than expected indicating perhaps how seriously the potential for collapse on this corner was taken. The contractors had been mainly occupied with preparing the deep pit on the north edge of the churchyard for the back drop inspection chamber. This meant that it was not possible to further excavate the pipe trench so a more detailed assessment of the density of burials remains to be done tomorrow. The tower footings revealed. Detail of skeleton number 2. Four new interments bringing our total up to six at present. We spent the day coming close to completion of the main pipe trench using a combination of bladed and toothed buckets according to conditions. The first new burial, skeleton 3, was remarkably close to the surface, around 500mm and consisted of the lower right arm, pelvis and both femurs. The second burial of the day was significantly deeper with the skull appearing around 700mm down with the upper arms and chest being deeper still, close to the intended depth for the bottom of the trench. The skull suffered some damage from the digger but was already in a fragmentary state. Cleaning this up took most of the afternoon as it was packed around with hard clay all of which had to be carefully removed by trowel and palette knife. A couple of pieces of clay pipe steam, were in the fill of this grave indicating it is post-medieval, perhaps this accounts for the extra depth. 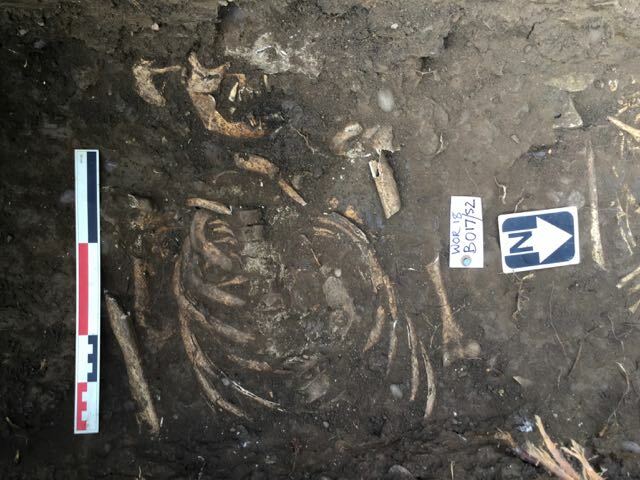 The remaining two burials have been identified but not yet cleaned. These together with the others have been covered over with black polythene and planks and ply sheeting. More burials appear along the length of the trench. Over to my store at Hanwell first thing to pick up the necessaries for mass skeleton lifting and storing. Back at Wormleighton a day to pretty well finish off the pipe trench including its extension to the north wall of the north aisle. A start was made on lifting the bones identified and recorded earlier in the week. Unfortunately, as I rather suspected given the shallow nature of the first round of interments we have secondary burials at a lower level but still high enough to need removal. 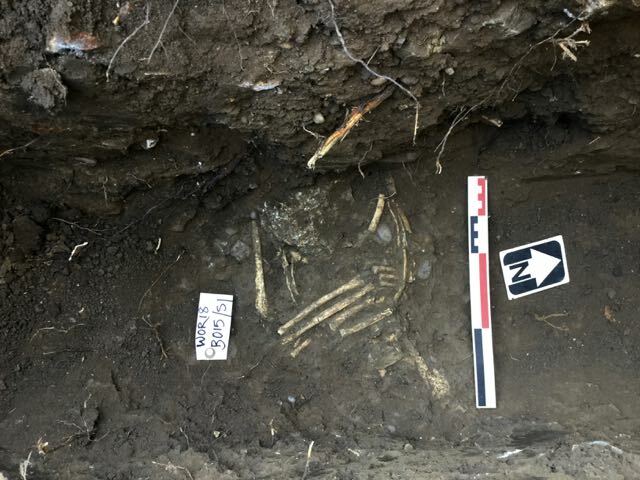 Together with other new burials towards the south end of the trench we have something of a sea of bones with nine intact burials demanding attention. I am fairly confident that at most there might be one or two more but my plan is to work Saturday morning and all day Sunday to clean, record and lift these burials. As I said yesterday my plan to to have the site cleared by Monday morning for David and his team to start pipe laying. This one was closest to the church and was probably coffined. Not a huge amount to report from this morning’s session, three more graves cleared of bones which are now bagged up and stored in church. 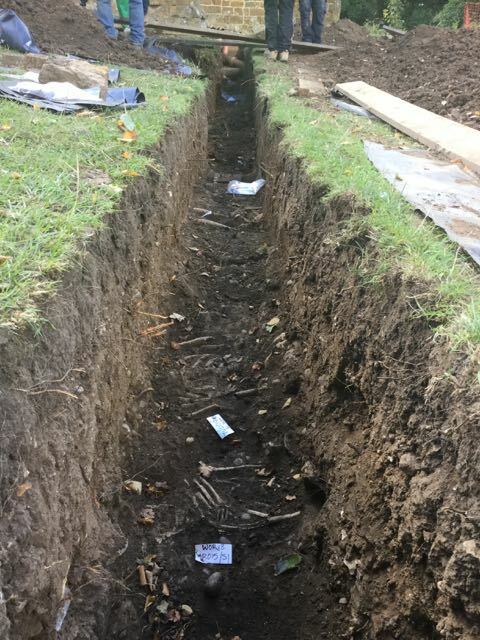 A new grave spotted yesterday proved very interesting, comparatively well preserved bones but with the joy of added extra charnel: additional bones obviously disturbed whilst the new grave was being dug and then popped back into the ground with the new interment. These things are complicated to dig as you never quite know what’s coming up next. The other complication is discovering lower burials below the higher ones already excavated and removed. This was the case with Skeleton 4, once out of the way a couple of toe bones appeared where no toe bones should be and a little further excavation revealed a pair of feet and accompanying leg bones I’ll need to finish off cleaning this tomorrow. They lie right on the 800mm mark and may not need lifting. I also as a alternative to peering at bones cleaned up the lower courses of the corner buttress. The foundations are really quite impressive. For tomorrow I have three burials to excavate, record and lift which should be doable providing no other customers emerge. The extraordinary stone, part of the foundation for the diagonal buttress. So the last day of digging, at least as far as the archaeology is concerned.. Further examination of the bottom of the trench took our total of burials up to 12 and I suspect that that is roughly half the full number of interments in our patch, however, as we have no remit to dig deeper we’ll never know. Of particular interest was skeleton 6, the one nearest to church which although quite shallow was almost certainly coffined. the good state of preservation of the bones with lack of crushing and the position of the arms away from and parallel to the body all suggest this. A little further down the trench the legs of skeleton 9 projected across the junction between the main trench and the one to the north aisle. this particular individual had had the right femur chopped through and not by us. In fact it became clear that a later, and much deeper grave had been dug to the south east and in the fill of that grave, the missing portion of femur, dropped back in when it was filled. The skull of skeleton 10 was particularly well preserved but as this was nearly a metre down there was no need to to lift it and after recording it was filled back in. Almost at the other end of the trench a final clean up of skeleton 8 revealed that the femur lying next to it was not charnel (assorted bones gathered together and reburied ) but was the surviving remnant of another burial which again had been truncated by a later gave cut . I took another look at the foundation block for the buttress and was surprised to note that there was a single huge half dressed block which had clearly been reused and turned over. Thanks to Michael Abbott who dropped by and helped me with final set of levels and Verna who helped with the big clear up and Sheila who unlocked for the last few bones to be safely stored in church. A later, deeper burial cutting through a higher earlier one. The burials filled in and covered over.